A revolutionary book on cricket with ideas from chess: Dot Chess- The Cricket in Between (ISBN 8175258241) can now be tracked at the author's website: saumilzx.com and purchased at amazon.com. The examples cited are from the era of Sir Donald Bradman to the modern era of Sachin Tendulkar & Brian Lara, and also anticipating better statistical models and newer cricket variants for the future. Mumbai, India, April 17, 2007 --(PR.com)-- Saumilzx.com is pleased to announce the release of a revolutionary book on cricket with ideas from chess: Dot Chess- The Cricket in Between (ISBN 8175258241). The overview and excerpts can be tracked at the website: www.saumilzx.com and purchased at amazon.com under the ISBN number provided. 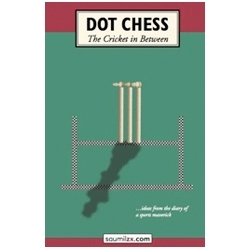 Dot Chess is about all that goes on in a game of cricket, in between runs and wickets; in between the intention and execution of play; and in between changing eras of cricket. The book begins with why dot balls exist in cricket and establishes why they are the underlying basis of cricket- 'skill-wise' and 'chess-wise'. Moreover, there is an attempt to use chess theories to explain and explore possible approaches in cricket and various other sports. Chess players are masters at recognizing, creating, and exploiting imbalance in arrangement of pieces, in a position which is otherwise equal. This Cricket Wolrd Cup 2007, has already shown some brilliant attempts at maximizing such imbalances. The World Cup is not over yet. What can we expect in the last phase? The book also introduces better statistical methods for analyzing performances, by understanding the nature of uncertainties of cricket (very important from the Indian perspective, where players undergo undue pressure from daily analysis in the media). The book is for Cricket fans and players as well. Chess players who have an interest in cricket may find it interesting. Cricketers not familiar with chess, can easily follow this book as the examples are from cricket matches, just the background concepts are from chess. Saumil Bhukhanwala, the author wishes to support sports-persons in India, being a sincere fan of various sports. He hopes that the book helps emphasizing that sport is far more academic than most of think it is, and that we, as fans, can understand that sports-persons have to compete at world standards unlike most professionals who rarely even have to be the best in their country to be seen as successful.